Our customers choose AMSOIL because of its consistent quality, measurable results and because switching to AMSOIL has proven a noticeable difference. We know that you will love our products so much, you will buy more,… for repeat customers like you, AMSOIL has developed our Loyalty program just for you. For personal Use… not for resale… however, use the Preferred Customer Membership to buy products for your friends or your club. Earn PC Points towards your next purchase or your PC membership renewal. Each $1 spent earns 1 PC point. 50PC points = $1.00 or equal 2% back on every purchase. 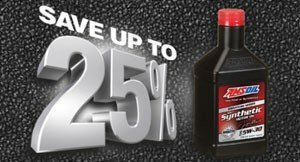 Preferred Customers buy all AMSOIL products at wholesale prices, a savings of up to 25 percent. With AMSOIL’s extensive line of products, you can buy synthetic lubricants for all your vehicles and equipment at a lower cost. Receive exclusive product promotions for Preferred Customers only. Preferred Customers earn reward points on all purchases. Every 50 points earned can be redeemable for $1 off any future order. Your points do not expire and you collect additional points with every order. Points can also be applied to membership renewal. Preferred Customers receive free shipping with orders of $100 USD/ $130 CAD. Each month, AMSOIL randomly selects Preferred Customers to receive free hats, shirts or other gear when they place an order. Preferred Customers who refer friends and family members to register as P.C.s or Dealers will receive 500 bonus points ($10 value) when the new customer makes a purchase. Simply send your friends and family to www.amsoil.com/friends to register.